Team: Philadelphia Flyers. Player: Justin Williams. Card Attributes: Autograph . Card Manufacturer: UpperDeck. Pictures are scans of the exact card you will receive. Original/Reprint: Original. Year/Season: 2001-02. 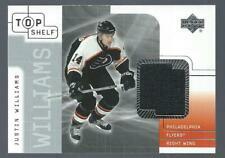 2001-02 Upper Deck Top Shelf Jersey - Justin Williams. Y ou will receive exact card as seen in scan.